The documentary Between the Folds is a brisk study of the intersection of intelligence and aesthetics in origami. The film, by the first time writer and director Vanessa Gould, gives an overview of the field, looks into the methods of folding, and interviews some of the big paper players of the past 50 years. Even with the film’s minor faults, Gould deserves enormous credit for producing a film that will fascinate everyone from precocious kids to high-minded architects. The film, the first on the subject in English, explores the combination of art, mathematics, diagrams, computational power, inspiration, and raw desire to create held within a simple piece of paper. Starting off a bit heavy on the arts-and-craftsy side of origami, Gould eases the audience into the topic, but if you wait patiently the wow factor is delivered momentarily. The film jumps forward to contemporary practitioners who are pursuing more abstract and complicated objects. 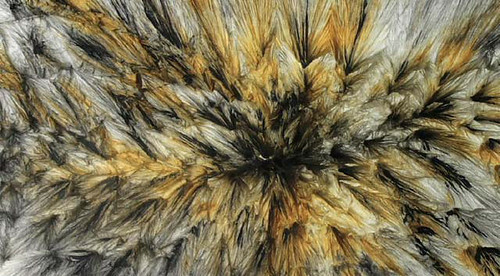 Their efforts can easily be compared to abstract artists, classical composers, and mathematicians. Indeed, not only have many trained in the field of mathematics, but they often use origami as a visual devise to teach to students in primary schools in Israel and universities in the U.S.
During one of the more mirthful moments Tel Aviv artist Paul Jackson discusses the “single fold” technique where he works to reduce the project to its bare minimum. In a breath-holding scene we watch Chicago folder Chris Palmer do his thing–he pushes forward at moments when most would either be satisfied the work was done or just be too timid to go any further. Unfortunately, the movie does not dwell long enough in these moments and only briefly touches on real world applications like a compacted solar array designed to unfold in outer space or airbags in new cars. With a brief running time of 55 minutes apparently there is only so much that could be fit into this survey. 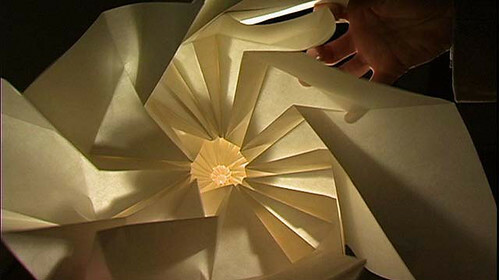 What the film does best is relate the vast potential in origami. Paper folding may be an ancient art– practiced for centuries in Asia by masters and currently at dinner tables everywhere by restless eaters–but the greater concepts and methods of physical folding have yet to come close to breaching its own boundaries. Sure, many architects have spent hours toiling in seminars and design reviews with the concepts of the Smooth / Striated. But these efforts simply do not compare to the elucidation experienced watching Erik Demaine (a MacArthur Genuis grant winner and professor at MIT) and his father Martin explain their solution to the single cut and fold problem. It looks simple in essence, but you realize how untapped the field is and how fantastic the potentials are. 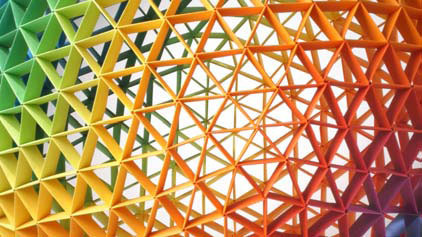 The fascination really starts when we see the possibilities in origami techniques for architecture. These systems may provide more methods for tackling the currently vexing question of ornament. With ever tightening budgets, continued reduction of skilled labor in construction, and misappropriation of the minimalism as a way to make less expensive projects, macro and micro folding solutions may present new avenues for generating evocative, meaningful, and well executed facades and structures. Or for the morphologists / blobists / maya-masters in the room, the deep focus of origami’s methods may provide the refining and strengthening of processes needed to grow the field out of its toddler stage and into a more mature phase. Like the great documentary Rivers and Tides about the artist Andrew Goldsworthy, Between the Folds makes you want to run out and start practicing and tinkering with the art form. The apparent simplicity and unbounded sense of opportunity are great seducers, but it is the shear sense of fun that makes us want to try it, a spirit amply captured in the film. Between the Folds will be shown on PBS stations as part of the Independent Lens series across the USA in December 2009 and early 2010. Check your local listings. PBS and Independent Lens will be streaming the film in December until 22nd. Click here for more information and interactive games.